It is hard to understand the approaching route even with the Japanese official pilot book. Then, I took a waypoint 26 17.5N 127 42.1E off Ginowan bay. Once you move closer to the waypoint, you will find big red No.2 buoy. Then proceeding to the next waypoint 26 16.7N 127 42.9E, you will find red No.4 and green No.3 buoys. Taking the course on 142 degree without change, you will see green No.5 at your front and red No.6 at your right. Note: these green No.5 and red No.6 are for another route to another port, Maki Port. Then, do not move closer to green No.5. a white light house which might be unclear. Proceeding in the middle of green No.1 buoy at your left and red No.2 at your right, you move into the port entrance. At night, only big red No.2 and red No.6 at the Maki Port entrance are lighting. you will see the guest berths which are marked with numbers from 1 to 9. It is easy to find them for visitors because of clear marks on the nine poles. 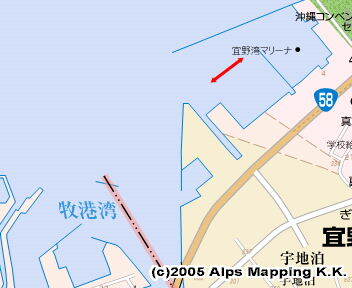 The guest berth is located in the northwest side, which is close to the entrance. When I visited there, only one berth was filled with a boat. The length of the pontoon is long enough to moor my 33ft length boat. The life in the marina is somewhat inconvenient. The bus service is not so frequent. No.32 bus line takes you to the downtown Naha City for 40 minutes. Other lines take over 1 hour and 40 minutes. The JPY450 fee was not reasonable. Water and Power are fee-based. Buy fuel at the marina office. Clean 24hr open toilets at the back side of the office. Shower rooms at the office. No public bath house is around. If you have a car, there is one in Yomitan with JPY420 entrance fee. Another is 10 minutes bicycle away with JPY1500 entrance fee. There is a coin laundry 7 minutes walk away at the back side of a big apartment house in front of the marina. A convenience store is 8 minutes walk away. A big supermarket “San-ei” is 10 minutes bicycle ride away. Other than Laguna Garden Hotel, no restaurant is around. Walk for 15-20 minutes. Even in November and December, it is warm and sometimes hot in Okinawa Prefecture which has Ginowan City. I was cruising islands of Awakunijima and Kumeshima; and returned to Ginowan on Dec 13th after a month later. The clear days were rare and the high wave advisory was being issued on most of the days. I was staying at Kumeshima for 12-13 days amid continuing high wave advisories. As I had no advisory on a day, I moved to Zamami. But, next day, I had to stay there again because of the advisory. Then, I understood why Okinawa local people do not ride boats in Nov or Dec. In March and April, the temperature is very high compared to Tokyo. But, it gets cool down next day on most of those days. The daily difference between temperatures is large. You feel coldness with the daily difference of temperatures, not with the temperature itself. After two hot days, as I thought T shirts were now suitable, I have stored all winter wear. But, the temperature got down again next day, I had to pull out winter wear and dress them in layers. Many times with people there, I exchanged greetings such as “It’s cold today”. The weather is changing quickly. The wind suddenly starts blowing. The clear calm day is rare. Okinawa local people taught me that you should be careful about the February Wind. It is a strong Typhoon level wind, changing quickly, not shown on the weather map, keeping blowing through the old lunar calendar February. In the old lunar calendar, February ends on April 18th in 2007. Then they advised me to postpone my departure until April 18th. My original departure plan was early April though, I followed local people’s advice. Actually, clear calm days were rare in March through mid April. 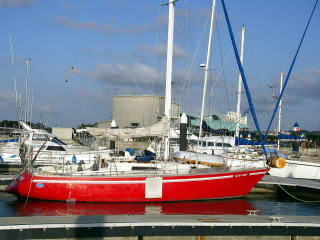 I put my boat at Ginowan for 4 months from Dec 13th, 2006, through April 12th, 2007.
the total fee was JPY129,508. I applied a 3 month mooring initially, and then extended it to 4 months. For painting the bottom and the hull, I put the boat on the slip yard for 10 days. The hoisting crane fee for up and down was JPY4,540, which was reasonable. The daily cradle usage fee was JPY3,240, which was not reasonable. In my lucky case, my friend allowed me to use his cradle.